Today a foreigner visiting Malta has the feeling that the southern part of the island is occupied by just one large conurbation. The historical walled towns seem to have lost their identities and the urban landscape outside them appears dull and void of interesting monuments. The Maltese instead do not see the conurbation, but a series of distinct communities grouped around a parish church and having their own traditions. After the failed 1565 Ottoman attempt to seize Malta, fears to live outside a walled town gradually subsided and the villages of farmers became small towns; this process was formally certified by the creation of new parishes (their number has grown from ten in 1436 to seventy today). Rabat (town in Arabic) together with Mdina (walled town in Arabic) stands on the site of the ancient Roman town. It retains several interesting churches, including St. Augustin's which was designed by Gerolamo Cassar before the Maltese architect was commissioned St. John's in Valletta. 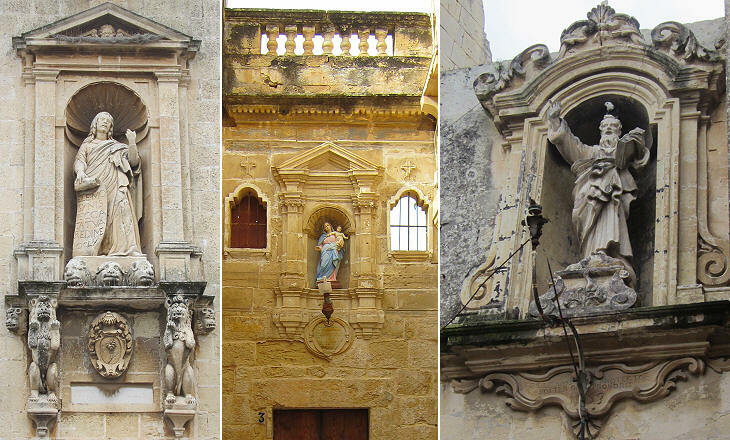 St. Cataldus' is an interesting example of XVIIIth century architecture with a statue of the saint (an VIIIth century Irish Bishop of Taranto, chiefly venerated in southern Italy) in front of the façade, a feature of many Maltese churches. The monastery adjoining St. Augustin's was rebuilt in the XVIIIth century on the basis of drawings by Gabriele Valvassori, an architect best known for having designed the façade of Palazzo Pamphilj in Via Lata in Rome. In addition to being the architect of the Pamphilj, Valvassori was the architect of the Augustinian Order in 1723-46. 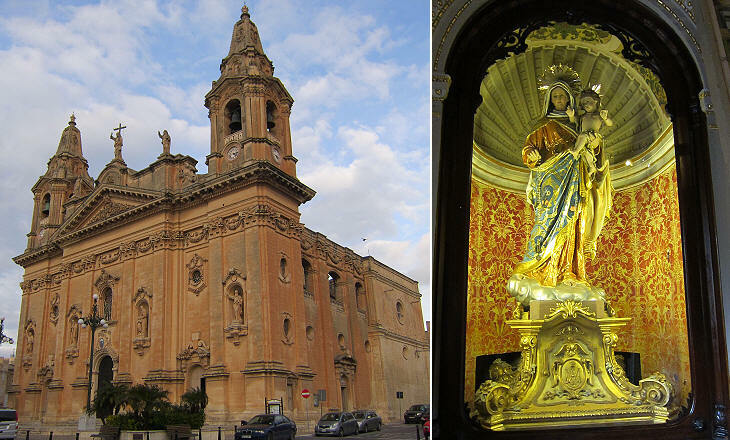 Similar to nearby Mdina, the main church of Rabat is dedicated to St. Paul. 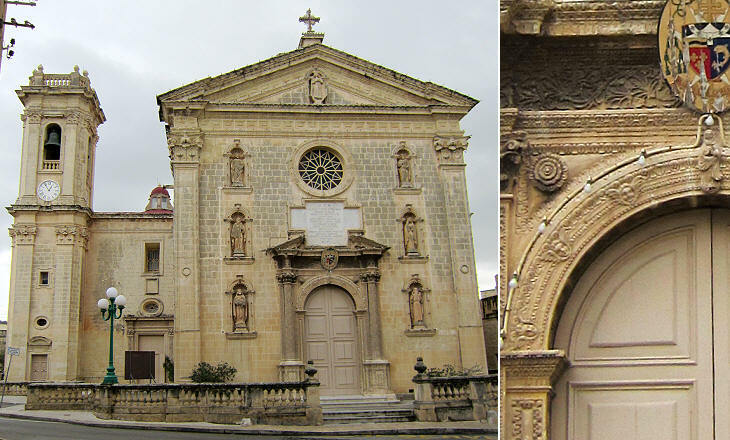 The façade was designed by Lawrence Gafà in ca 1681; it largely exceeds the actual size of the building; only the central door gives access to the church; the right one leads to a separate church dedicated to Publius, the first Maltese Christian, and the left one is merely decorative, similar to a theatrical wing. 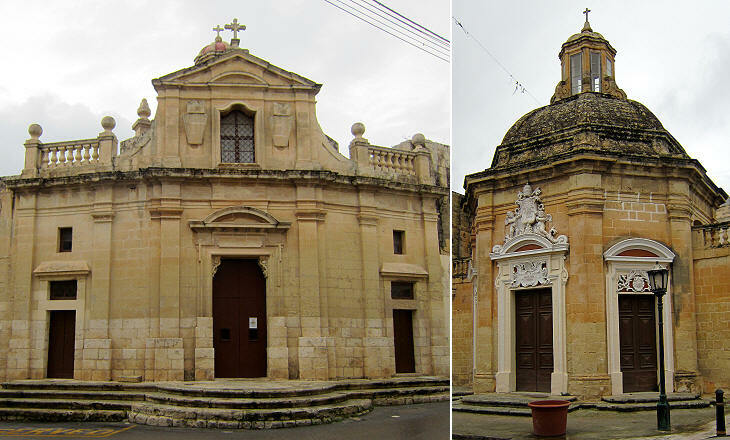 Zebbug is one of the ten historical parishes of Malta; the main church was initiated towards the end of the XVIth century, but it was completed in 1660. Other additions were made in the XXth century in order to enlarge it. Our Lady of Grace was built in the early XVIIth century and it has retained its original façade. When Mark Twain visited Rome in 1867 he was impressed by the number of churches dedicated to the Virgin Mary. Had he visited Malta he would have been similarly impressed. 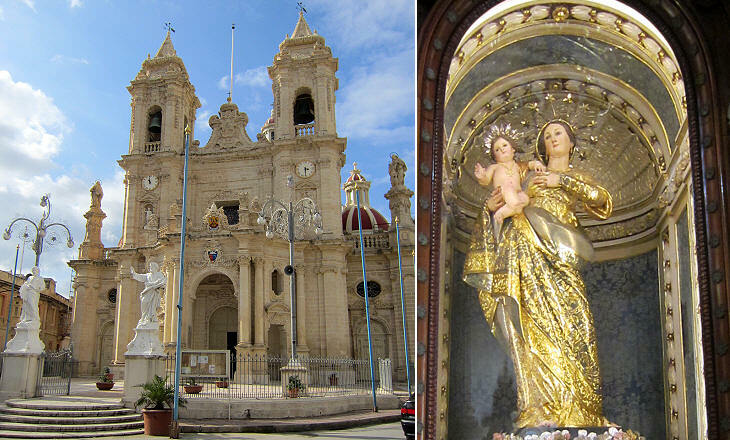 Zebbug has no less than ten churches/chapels dedicated to Mary. The feeling of being in the countryside is rather rare on today's Malta. Tal Hlas is a small shrine where pregnant women went to pray for a safe delivery. It was rebuilt by Lawrence Gafà after the 1693 earthquake which struck the island. Its charming rural surroundings enhance the grace of Gafà's design. 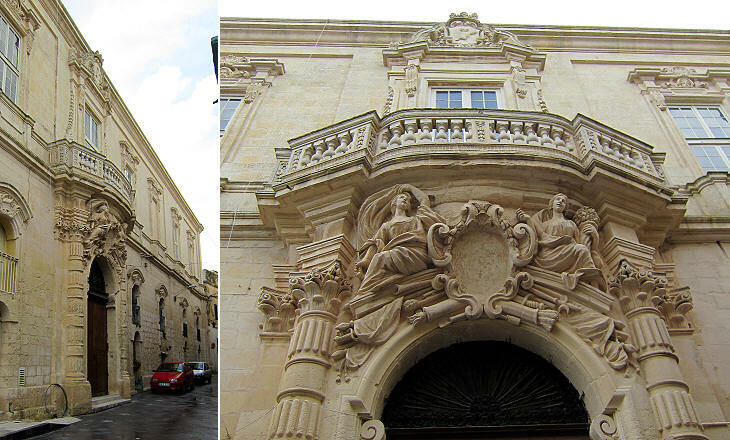 It is located on the old road which linked Mdina to Borgo. 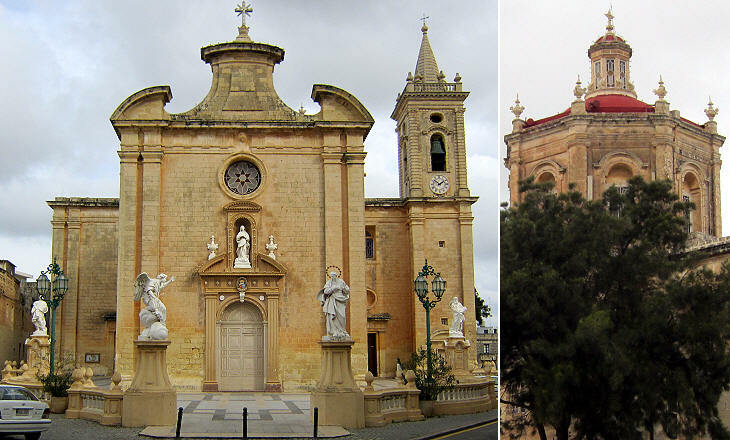 Zejtun is one of the ten historical parishes of Malta; the town is located near the south-eastern coast of the island. Its parish church is another fine work by Lawrence Gafà (the dome was redesigned in the XXth century). It is dedicated to St. Catherine of the Wheel; the statue which is carried in procession was most likely made in Rome in the late XIXth century. Although at the time the Ottoman threat had vanished, the saint was portrayed with the head of an Ottoman commander at her feet as shown in the icon of this section. During the 1565 Great Siege of Malta the Knights had the vision of a woman dressed in white walking along the walls accompanied by two men. They associated this vision with a painting at a small rural church dedicated to Our Lady of All Graces. After the siege had been lifted the chapel was turned into a shrine and in 1616 it became a parish church to which the Knights, including the Grand Masters, presented ex-votos, some of which can be seen in a museum near the church. In 1641 the chapel was replaced by a church which was enlarged in the following century and modified in the XXth century. The overall result is quite good, something which cannot be said for other churches which have been modified/enlarged. 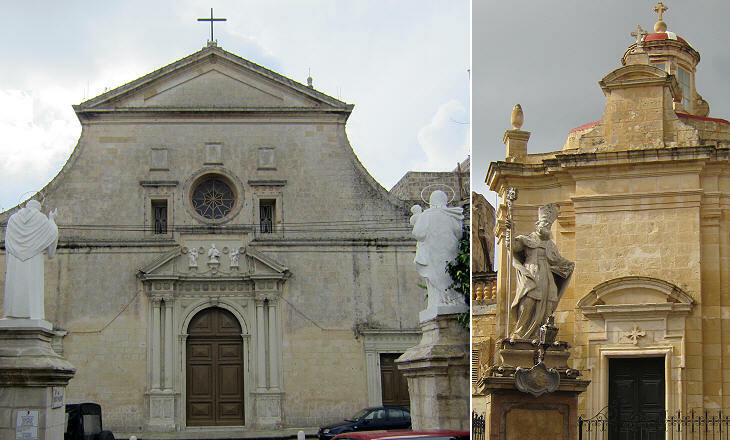 Attard, on the road between Valletta and Mdina, became a parish in 1575 and its main church was designed in 1613-16 by Thomas Dingli, a Maltese architect. Apart from the bell tower which was added in 1718, the church retains its original design. Balzan was a village located very near Attard and it became a parish in 1655. The increase in the number of parishes was an effect of the growth of the population of the island, which was interrupted by a devastating plague in 1675-76 which killed an estimated 11,300 persons out of a population of about 70,000. 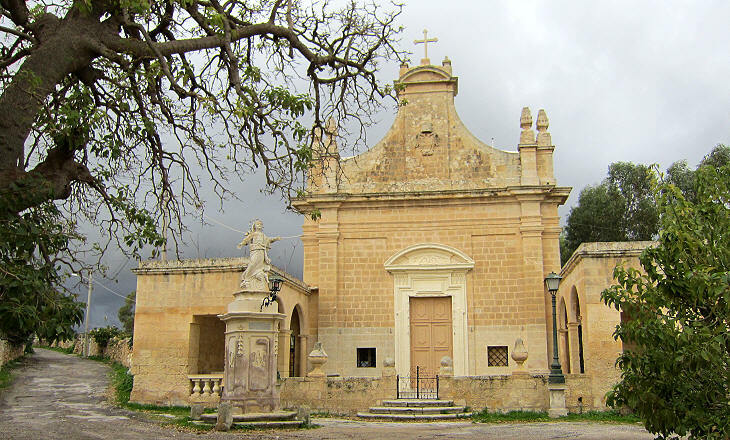 The parish church of Attard was initiated in 1670, but it was completed only in 1695, perhaps because of the consequences of the plague. 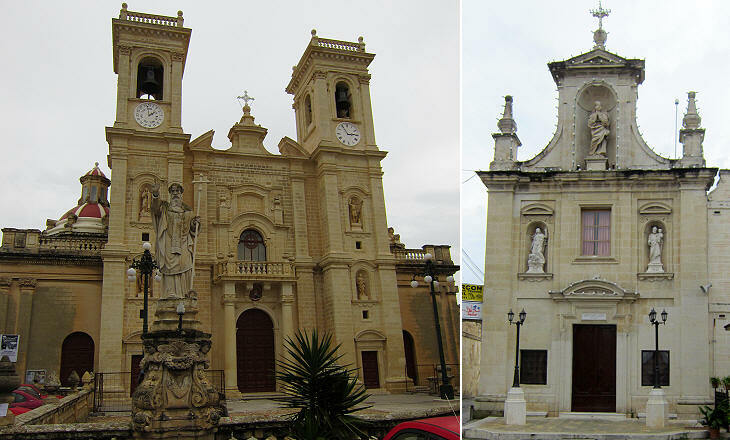 Mosta is another village which became a parish in the XVIIth century. 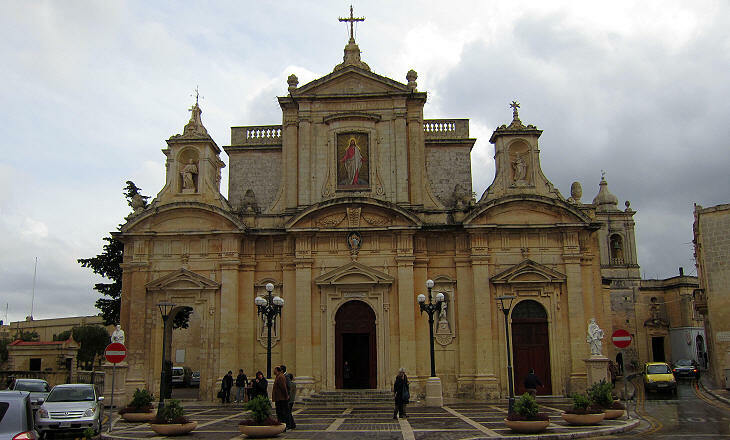 Its church was designed by Thomas Dingli, but it was pulled down in 1830 to make room for a gigantic building. 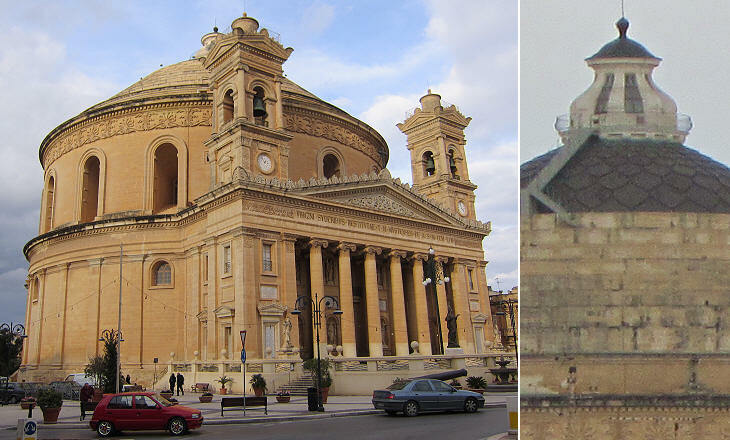 In the intentions of George Grognet de Vasse, a Maltese architect of French origin, the new church should have resembled the Pantheon of Rome aka La Rotonda which at the time had two small bell towers. 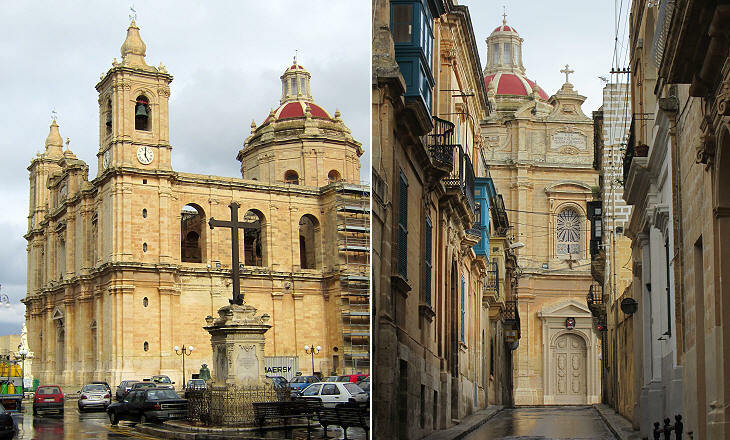 Current tourist guides indicate St. Mary's among the "must see" of Malta, but unless one is fascinated by size, the building hardly deserves such a high rating. This small XVIIIth century shrine is associated with the fear of pirate raids which the Maltese experienced for centuries. According to tradition a young woman hid in a cave during one such raid and she prayed for her safety. Then a spider wove such a thick web at the entrance to the cave that the pirates did not notice the young woman. Naxxar is one of the historical parishes and its main church was built by Thomas Dingli in 1616, but in the early XXth century side aisles were added and an entirely new façade framed by gigantic bell towers was built. Naxxar is located to the north of Valletta and it is only a few miles away from Mosta. Our Lady of Victories is an example of the competition among parishioners at having the largest church of the island. 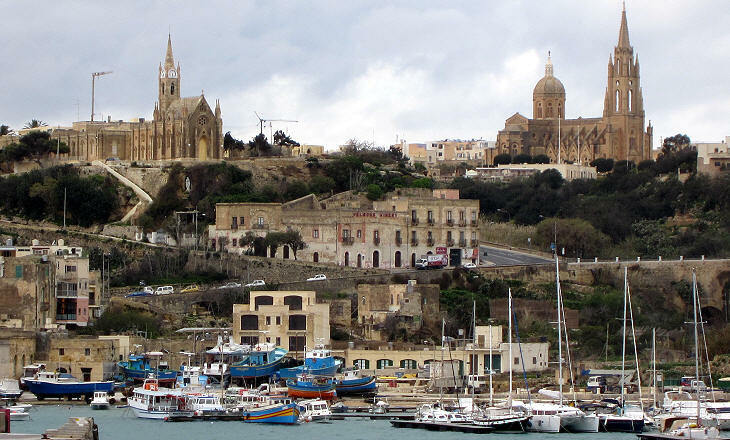 The foreigner who arrives at Gozo is struck by seeing two gigantic churches which were built in the late XIXth century (Our Lady of Lourdes) and in the early XXth century (Our Lady of Loreto). Their construction was financed by donations, many of which were made from parishioners who had migrated. In the early XIXth century many Maltese migrated to Tunisia, Tripoli and Alexandria, but in the second half of the century they left for faraway countries such as Australia and Canada. 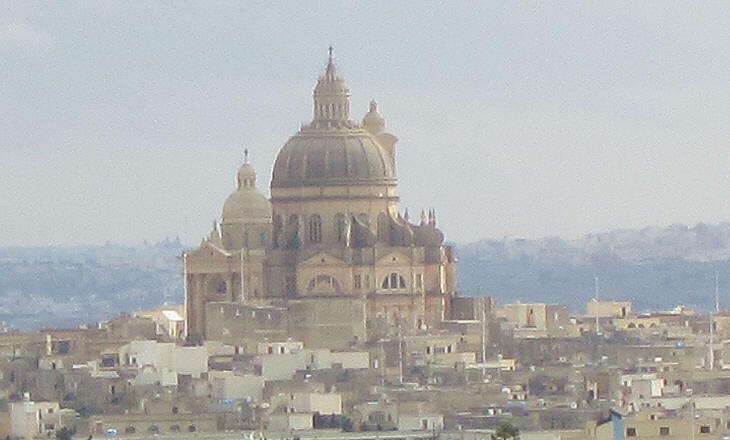 Xewkija became the second parish of Gozo in 1678. Its main church was built in the XVIIIth century, but in 1952 it was pulled down to make room for a new church designed by Giuseppe Damato which was completed in 1978. 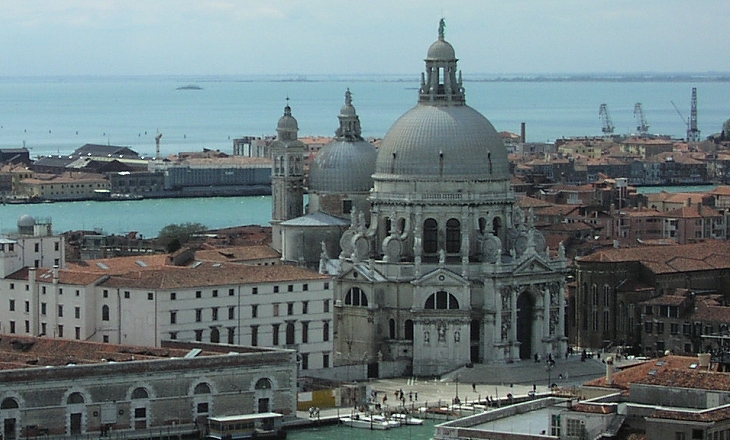 The overall aspect of the dome resembles that of S. Maria della Salute in Venice (it opens in another window) and the lantern that of S. Pietro in Rome. Marina Street is a waterfront promenade along Sliema Creek opposite Valletta where many restaurants and cafes are located. Jesus of Nazareth is a large church in Marina Street which was rebuilt after having been damaged during WWII. It was founded in 1895. It is decorated with references to St. Dominic because for some time it was assigned to Dominican friars. 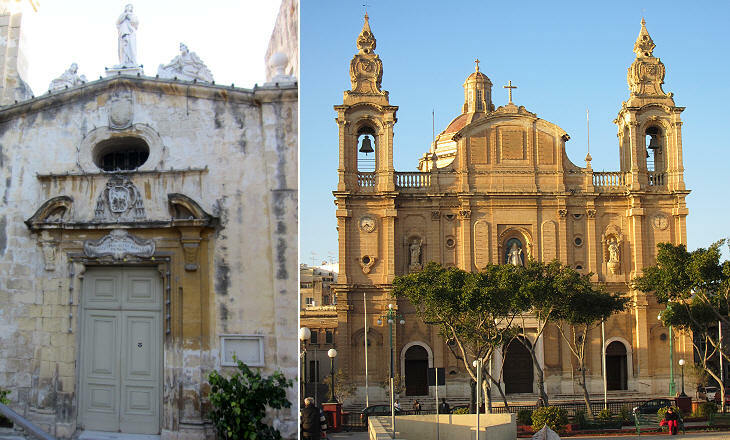 Tourists staying at Sliema see several churches on their way to Valletta; of these Our Lady of Sorrows is the only one having a historical background as it was built in 1592-93 near a cemetery where the victims of a plague were buried. 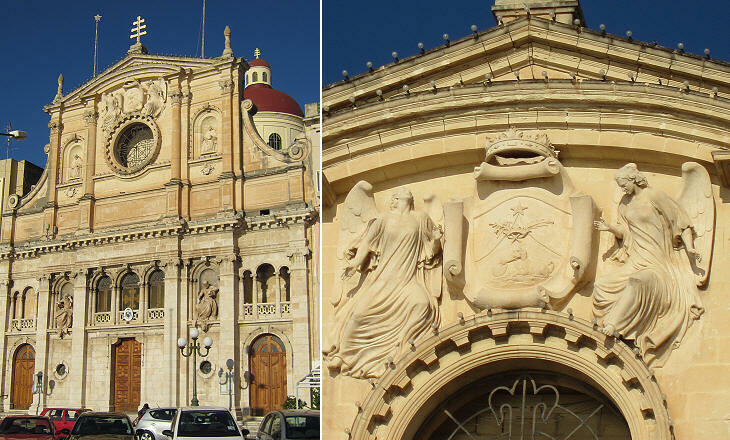 St. Joseph's is located at Msida Creek, the innermost bay of Marsamxett Harbour. 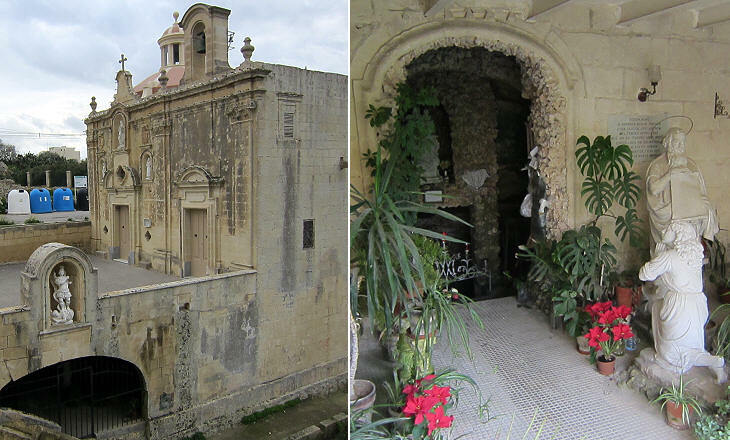 It was built in 1889 in a style which is consistent with that prevailing on Malta. 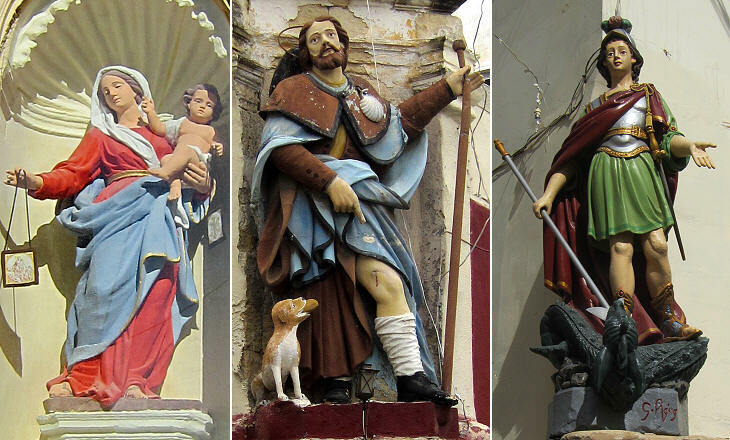 The Roman Catholic character of Malta is evident in the many sacred images which one can see along the streets of the island. They usually have an inscription stating the number of days of indulgence which are granted to those who pray before them. Their lamps were the only street lights until the installation of gas lights. You may wish to see a page on the sacred images of Rome. The image used as background for this page shows an ex-voto painting of Our Lady of All Graces at Zabbar showing Maltese ships in danger near Crete.